As you may be aware, due to lack of support, the Black Diamond's 2015 Christmas Ceilidh had to be cancelled. An annual Ceilidh has always been part of the life of the Club, and if possible we would like to carry on running them. 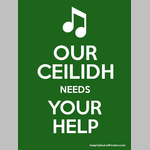 In order to understand what caused the Ceilidh to be cancelled and if there is a will for us to carry on running them, a short questionnaire has been put together to get some feedback from the people who attend/have attended. It is hoped that you will complete the Questionnaire and submit it to us, to enable a decision to be made as to their future. The questionnaire is completely anonymous, no name or email address is requested or saved. The questionnaire is hosted by Google Forms, please click the link below, which will open in a new window or tab, to start. Our thanks, in advance for your help.